Did you know that I often write posts a week or two before they’re published? (So actually by the time your reading this, the rain will have been a week ago.) It makes it easier to work a week or two ahead of time, but I like writing about what is happening right now, so I hope you don’t mind the slight delay. 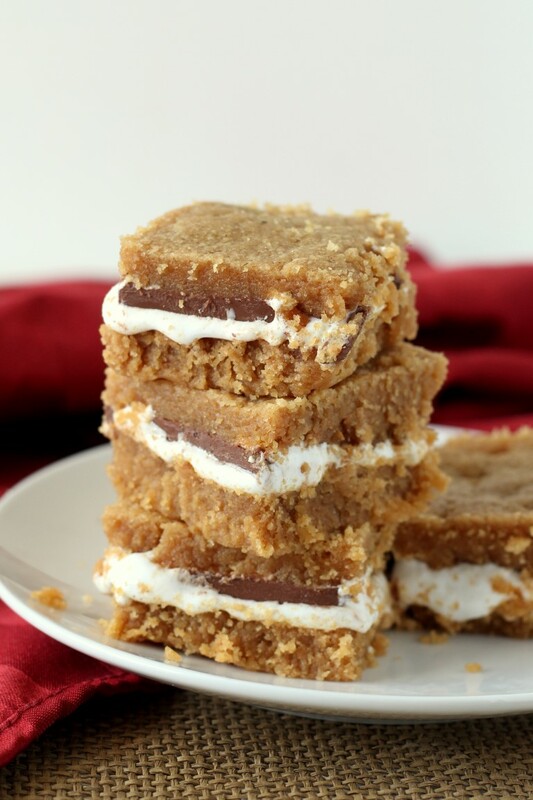 I know I’ve mentioned this before, but I love the flavors of s’mores in desserts better than an actually s’more. Traditional s’mores get a little dry for my liking. Although, if the marshmallow is perfectly toasted and melted all the way through, I can’t resist it. 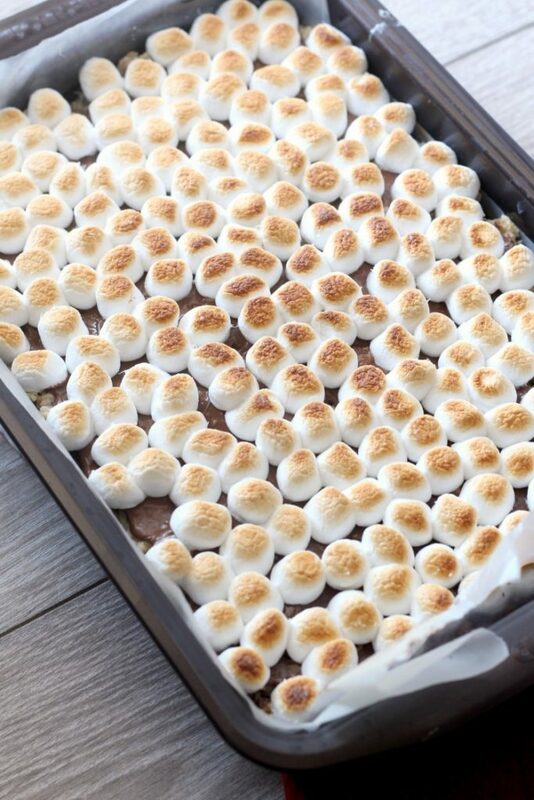 This summer, I’ve been recreating s’mores in my kitchen. First were these S’mores Brownie Bites and then I made a S’mores Nutella Cookie Pie. These S’mores Rice Krispie Treats are the easiest version yet. Because there is nothing easier than making a rice krispie treat. It’s also the stickiest business you can find in the kitchen. 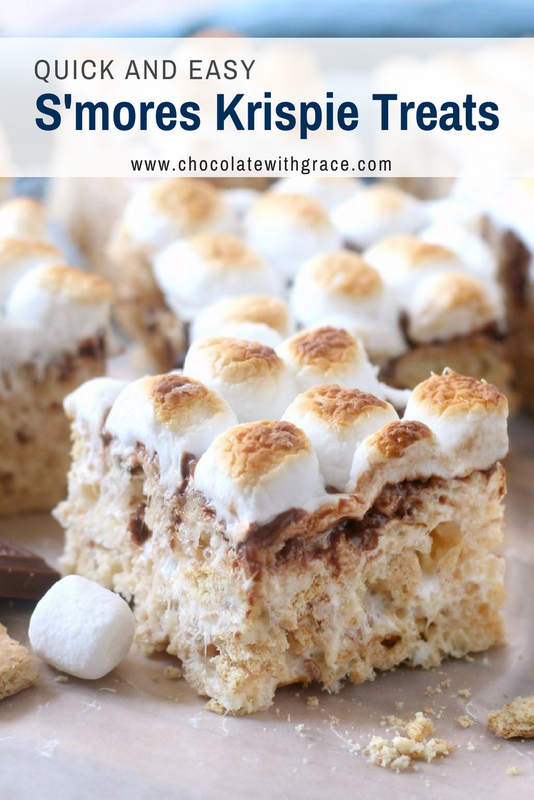 To make these extra delicious, I went the extra step and toasted some marshmallows under the broiler until golden brown before mixing them in with the rice krispies and graham crackers. You could skip this step, (Or use a kitchen torch), but I think it makes them extra good and is worth turning on the oven for. 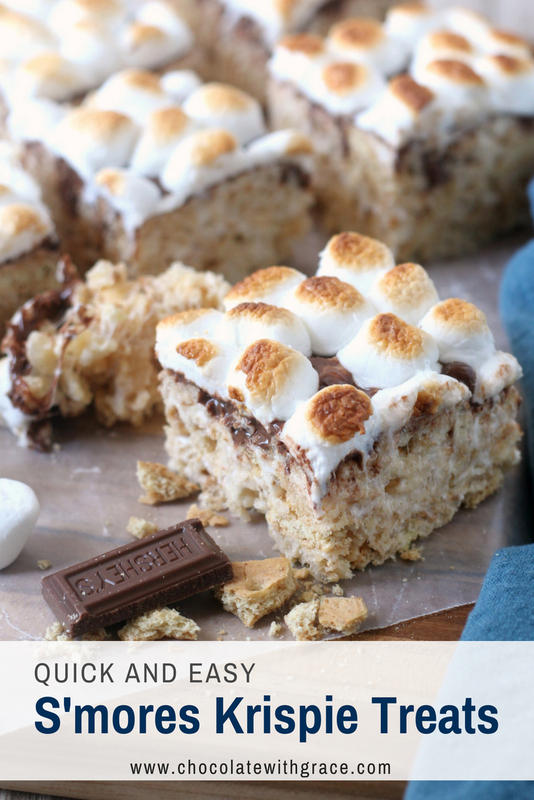 You’ll notice that this recipe has quite a few more marshmallows than the standard, original rice krispie treat recipe. I added a whole extra package, because we needed a few more, since I added the crushed graham crackers. And dry rice krispie treats are not enjoyable. 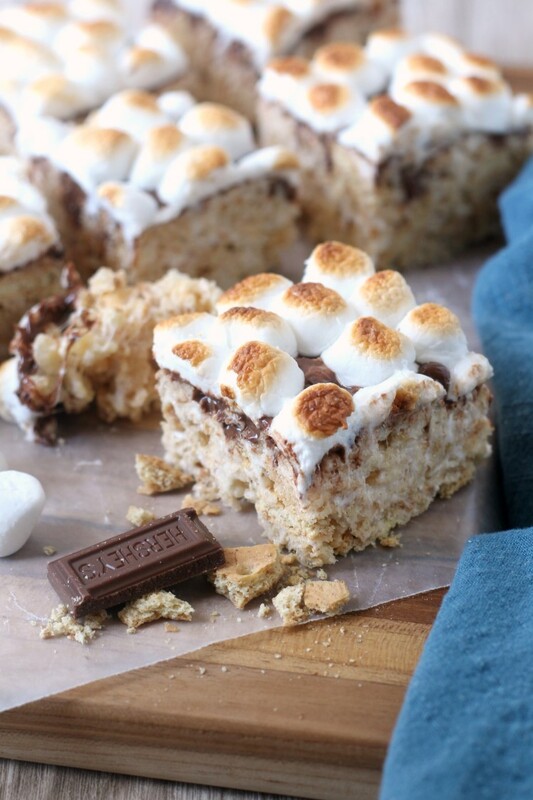 The more marshmallows the better, right? 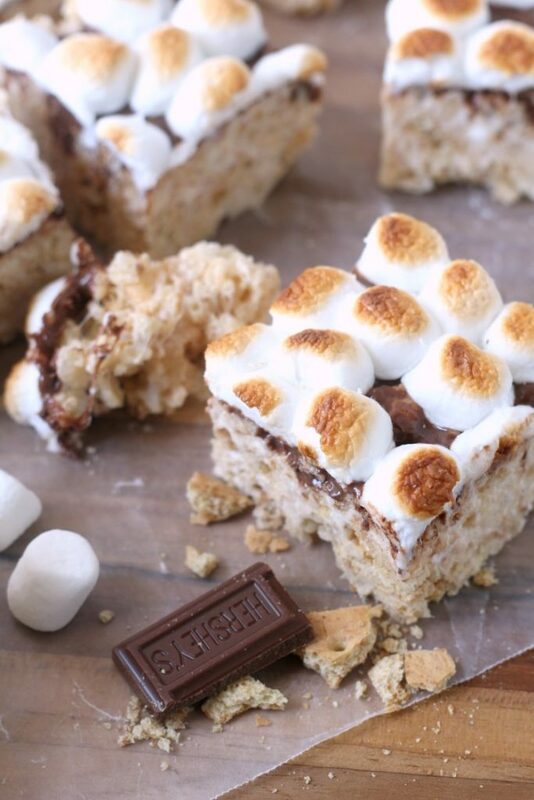 These S'mores Rice Krispie Treats are a fun summer treat for kids and adults alike. 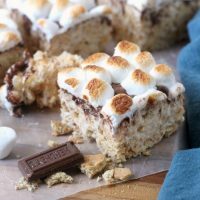 Crushed Graham Cracker are mixed with rice krispies and toasted marshmallows and topped with milk chocolate and more toasted marshmallows. Begin by prepping all ingredients and greasing a 9 x 13 inch baking dish and spatula before starting. In a large saucepan, melt the butter, add the bag of large marshmallows and stir over low heat until melted. Add the melted marshmallows and the toasted marshmallows (a greased spatula makes all this easier) to the bowl of rice krispies and stir until combined. Gently press the mixture into the greased 9 x 13 pan. 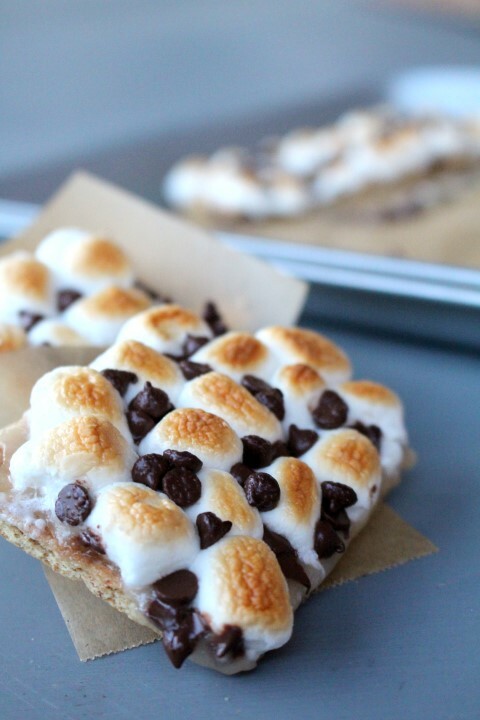 Immediately top with the hershey bar pieces or chocolate chips. Pop the pan into the warm oven for a few minutes to melt the chocolate and then spread with a knife. Top the bars with the remaining half a bag of mini marshmallows and again place the whole pan under the broiler for a minute or so, just until toasted. Let cool completely before cutting into bars. The sticky marshmallows make cutting them difficult, so I greased my knife and every few slices washed and re-greased it. Best served within a day or two. Here some of my other favorite S’more Treats for summertime.